While holographic polishes are often popular in jewel tones, there's something delightfully mysterious about neutral holographic shades. The little peek of rainbow sparkle from the smokiness can add the perfect finishing touch to an alluring gray, and I Love Nail Polish has really embraced that idea in the two shades I've used for today's nail art. While my new rounded nail shape still seems a bit foreign to me, I am totally loving the change. I think that lighter colors make the shape look nicest, so I thought I'd do a soft pink manicure to celebrate my "curves." Of course, I couldn't just leave it plain, so I jazzed it up with some studs and a faux splatter accent nail. I'm so excited this morning because today is the first post day for The Lacquer Legion! 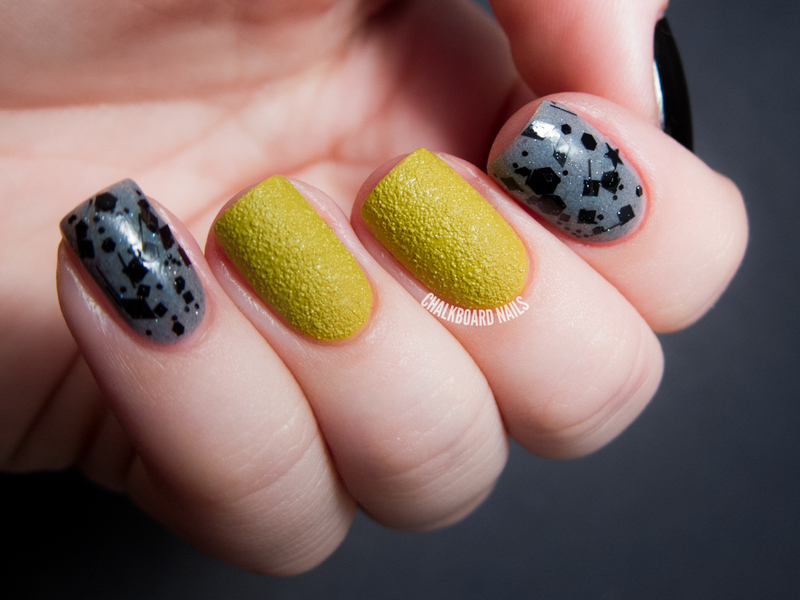 I put together this new nail art challenge group to bring the nail community together in 2014, and I'm proud to have some talented ladies on board as admins with me: Rebecca Likes Nails, The Nailasaurus, and Work/Play/Polish. This month's challenge was reinvention, and I've interpreted that in a few ways for my manicure today. You probably know of my deep-rooted and unending love for texture polishes, but one area of the trend that I haven't really dove into yet is creme textures. These polishes are a single flat color with no sparkle, glitter, or shimmer, but with the same texture effect that you know and love. Opinions seem to be pretty mixed on these; many people just don't like the finished effect. I thought I'd give them a fair shot and incorporate one into an edgy, punky manicure to see if I could make it work. I've been playing around with the OPI x Gwen Stefani collaboration collection lately, and I have to say I am really excited about it. I am particularly jazzed about Love.Angel.Music.Baby, the gold satin finish lacquer. For this nail art, I've paired the two satin finish polishes from this collection with Gwen's glossy signature red shade. Question of the Week: So tell the truth, how do you REALLY feel about Radiant Orchid? Sarah's Answer: I love it! I wasn't particularly inspired by 2013's color (emerald isn't my jam) so I was thrilled to see a bright, cheery purple-pink come into play this year. Lipglossiping - finally gets her hands on a product that had been eluding her for months: L’oreal’s Infallible Eyeshadow in Metallic Lilac - better late than never! My Beauty Bunny - Giveaway alert! We've teamed up with derma e and 15 beauty bloggers to offer a fabulous prize package of 5 natural skin care products AND a $250 Visa Gift Card! Nouveau Cheap - put the new Maybelline Baby Skin Instant Pore Eraser to the test and compared it to three other popular face primers. How did it do? Come see for yourself! Pink Sith - is a foundation adulterer. She can’t remain faithful to just one foundation. Check out her latest affair with Ben Nye HD Matte Foundation. Scandalous! 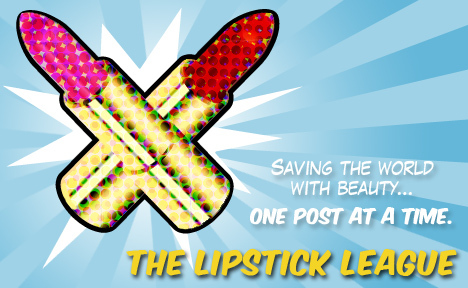 Prime Beauty - dishes on her Top 10 mascaras to make your lashes long, lush and bat-worthy! we heart this - books, booze and beauty; what could be better? Check out the intoxicating Literary Liquors Collection from Literary Lacquers. Chalkboard Nails - Emma Watson’s daring Dior Couture dress/pants combo from the Golden Globes inspires unique color blocking nail art! EauMG - For those of us that don’t look great in purple, Victoria has put together a perfume guide that will still have you rocking Pantone’s Color of the Year, Radiant Orchid. Gouldylox Reviews - New Light Catching Lip Colors from Bobbi Brown are too pretty to pass by! Can you even pick just one? Guest Post of the Week, as chosen by Lipglossiping - Safiyah’s FOTDs and eye tutorials always impress but her head-turning use of MAC’s Copper Sparkle in this one blew me away! 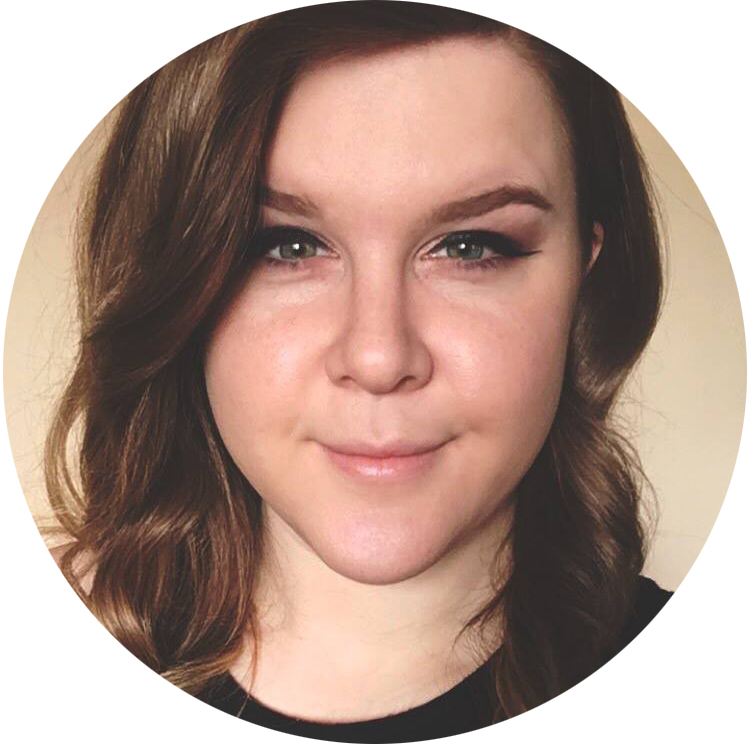 Recently, I was lucky enough to spend some time with OPI's social media gal, Jaqueleen. She stopped by my house in Phoenix where we talked polish, nail art, blogs, and more...plus she got to bond with Chowder as she gave him "noodles" (that's his word for dog treats). I knew she would be checking out what I had on my nails, so I wanted to do a simple nail art manicure that was unique and fun. I put together this little somethin' somethin' with Nicole by OPI. Read on to see how to achieve this look yourself, plus check out the video interview series that I participated in! Last Sunday, All Lacquered Up, The PolishAholic and I hosted our first #NailGlossip Twitter Chat, and it went swimmingly. Since that was the night of the Golden Globes, we had a bunch of people show up to chat red carpet nails: what we liked, what we didn't, what we'd like to see more of. I mentioned that I would love to see more celebs rocking nail art matched to their outfits. For example, an actress wearing a dress with lace details could wear lace nail art, as well! 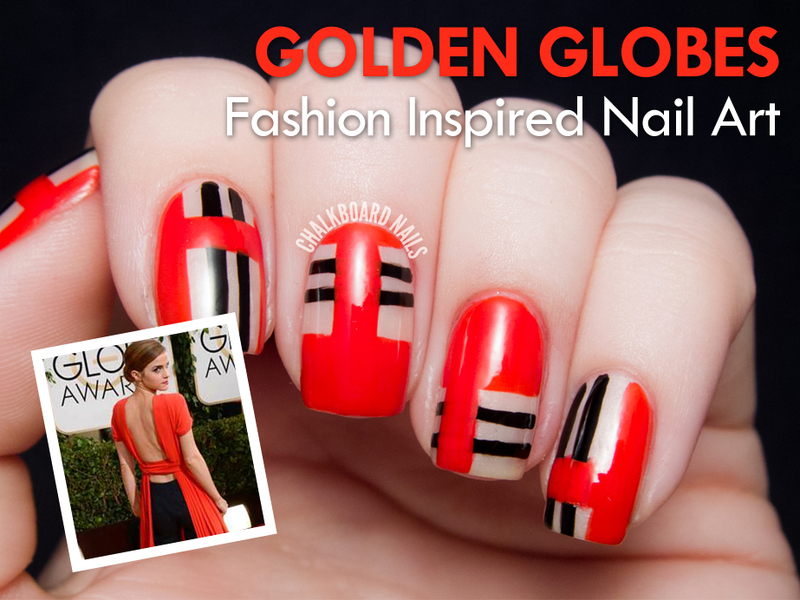 We were challenged to create nail art inspired by red carpet fashion, and I just couldn't get my mind off of Emma Watson's unique Dior ensemble. Read on for the details, and be sure to check out All Lacquered Up's manicure inspired by Mila Kunis' dress and The PolishAholic's nail art inspired by Ashley Madekwe's afterparty dress. 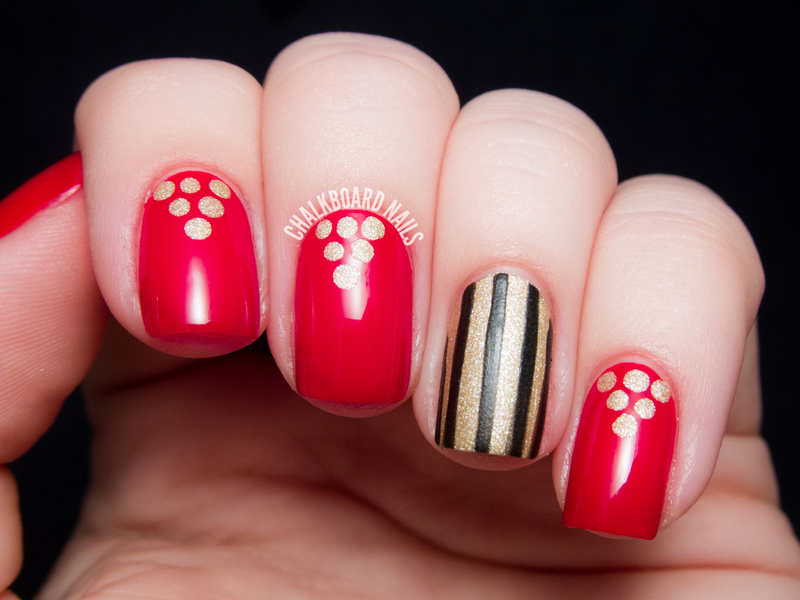 I've finally decided on my 13 favorite nail art manicures of 2013! These selections are based on my personal preferences, not post popularity. Unfortunately, I just couldn't bring myself to put them in any special order this year. So I've just put them all together in a collage, and included the links to each of the posts below. Which one is your favorite? Do you think I missed any crucial manicures? 2013 was a great year for Chalkboard Nails. I won the Tadashi Shoji Nail Art Challenge and got to provide input on a limited edition clutch, one of my photos was on The Today Show, I flew to NYC to judge the Sally Hansen I Heart Nail Art finale, a couple of my manicures were published in Redbook Magazine, I got to do an interview for Nail It! Magazine, and I participated in a video interview series for Nicole by OPI. I got to work with great brands, meet great people, and push my limits as a nail artist. I hope my good fortune continues in 2014! Get Involved with the Nail Community in 2014! One of the things that I like best about the nail community is how involved we all are. I am constantly seeing people supporting their fellow nail artists and bloggers through Instagram, Facebook, and Twitter! I remember how much I loved seeing everyone participating in the 31 Day Challenge together back in September. It really made me feel such a great sense of community. For 2014, I am participating in two projects that I believe will help foster that same sense of community. I hope you will consider participating! Twitter is a really fun and casual way to interact with the nail community, so it goes without saying that I'm really excited to be a co-host in a new, bi-weekly Twitter chat alongside Michelle from All Lacquered Up and Jen from The PolishAholic! Our first chat is taking place this Sunday, January 12th at 9PM EST. We'll be chatting about celebrity polish collaborations & red carpet nail trends (the Golden Globes are that night, after all), plus we've got some giveaway prizes to hand out throughout the chat for anyone that joins in on the fun! Follow us on Twitter @AllLacqueredUp, @ChalkboardNails, @ThePolishAholic and tweet using #NailGlossip. You can also RSVP to the chat on Twubs to follow the conversation, interact with us and get updates about future chats. Visit Twubs.com/NailGlossip to connect! In order to be eligible to win a prize during a #NailGlossip chat, you must be: A US Resident, follow @AllLacqueredUp @ChalkboardNails and @ThePolishAholic on Twitter and use the hashtag #NailGlossip. Winners will be randomly selected. You must provide your address within 48 hours of prize notification. Prizes will ship within 6 weeks of Twitter chat. It's no secret that sometimes even the most creative artists get into a slump! That's why I love things like the 31 Day Challenge - they really get your brain going and thinking outside of the box. But, let's face it, the 31 Day Challenge is INTENSE. And it only comes around once a year! I wanted to start a challenge group on my terms, and I gathered a fantastic group of ladies to help me out. Once a month, Rebecca, Sammy, Leslie, and I will be putting out a nail art prompt for your interpretation. Each prompt will have a post date and a specific hashtag to link everyone up. Since hashtags work across all social media platforms, you'll be able to easily track everyone that is participating! It's low commitment and fun. Stretch your creative limits! For January, the theme is "reinvention." 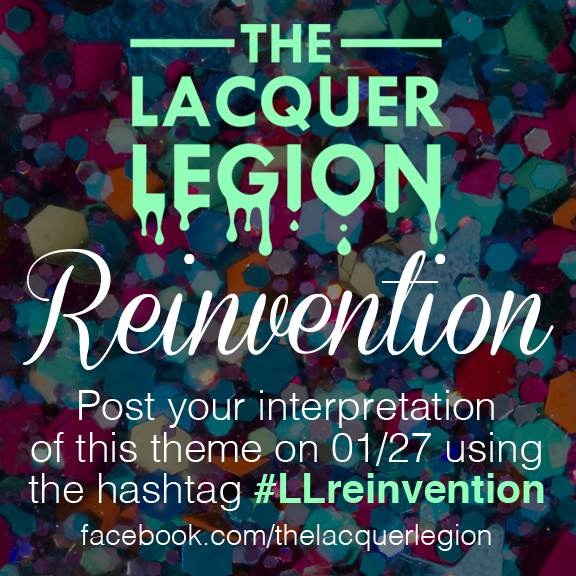 Interpret it however you want, then get ready to post your manicure on the 27th using the hashtag #LLreinvention. Have questions? 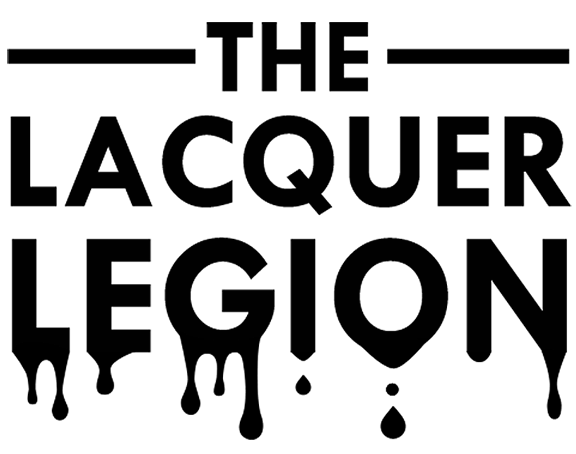 Hop on over to facebook.com/thelacquerlegion for more info (be sure to "Like" it for updates)! The four of us will be watching the page to answer any questions. I really hope you will participate in these awesome initiatives! I think both of these projects will be so much fun and I would love to see huge involvement from the community. Spread the word!